Film a video of you (or your band) performing an original song in front of a desk (any desk). Submit that YouTube video via our entry form. 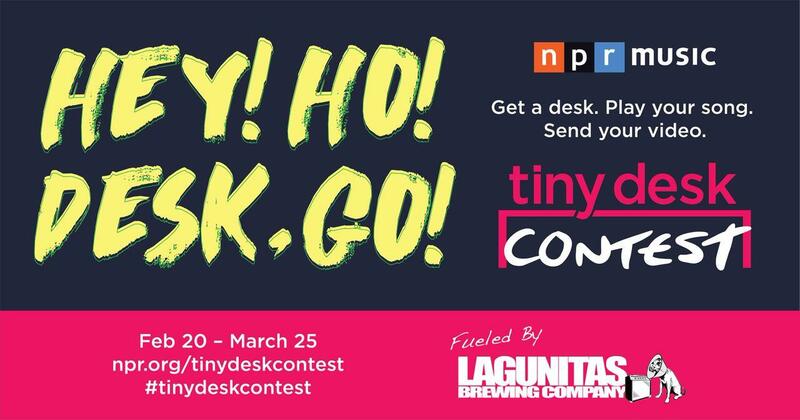 If you win, you'll play your very own Tiny Desk concert at NPR's headquarters in Washington, D.C. After that, you'll come on a nationwide tour with NPR Music and Lagunitas Brewing Company. If you want to make sure your entry is eligible, you can take this quiz (or check out the Official Rules). It is also recommended that you bookmark the Tiny Desk Contest FAQ page for some quick and easy answers to the most common questions. As you come together with friends and family to create music and memories, share your stories using the hashtag #TinyDeskContest or by emailing NPR Music. NPR Music will be highlighting interesting stories, artists and songs in the Tiny Desk Contest newsletter and on their blog along the way. And of course, our panel of judges will be watching your videos as they come in, and they can't wait to see what you create. Enter now! Deadline = 11:59 pm March 25th!